Our board of directors consist of activists, scientists, advocates, artists and environmental experts. Board members are nominated by existing members or selected because of the expertise they can provide to further our mission. Isis Spinola-Schwartz has been a campus and urban planner for over fifteen years. She is the co-founder of Sustainable Plans and Schwartz and Associates Landscape Architecture. Isis has extensive project management experience and has designed and implemented large scale institutional projects. Her focus is on the implementation of projects utilizing a collaborative approach with emphasis on natural resource conservation, sustainability, and sound financial management. Scott Fielder is a California attorney. He has been in private practice since 1978 and specializes in personal injury and wrongful death litigation. He has also worked extensively on a pro-bono (volunteer) basis on cases involving nuclear power plant decommissioning and safety. Along with his successful practice as an attorney Scott is an active scuba diver and marine conservationist. Jim Toomey is creator of ‘Sherman’s Lagoon’ a comic strip that appears in over 250 newspapers in North America and over 30 foreign countries. It combines two of his lifelong passions: Art and the Sea. His marine conservation work has also won him an Environmental Hero Award presented by NOAA, the National Oceanic and Atmospheric Administration. A graduate of Duke and Stanford, in 2008 Jim received his Masters of Environmental Management degree from the Nicholas School of the Environment and Earth Sciences at Duke. Wendy is a long-time environmental and marine conservation activist. She is co-founder and Trustee of the New Jersey Environmental Federation (NJEF), founder of the Mercer Citizens for Public Accountability, a member of the board of Shark Savers, and Advisory Trustee at Environmental Defense Fund. She served as an elected member of the Mercer County Board of Chosen Freeholders and the Princeton Borough Council. At the Sylvia Earle Alliance/Mission Blue, Charlotte Vick serves as curator for Google Earth’s “Explore the Ocean” layer introduced by Google in 2009. Working with over 350 ocean partners, this collaboration with Google has produced over 3,000 stories about marine life, science and exploration, ocean and atmosphere, ecosystems, marine protected areas and human connection in Google Earth. Charlotte is also the Director of Engagement for EarthX and has also worked in economic and environmental planning, project development and interactive media and ocean technology. Her network is international and global in scope. Vicki Nichols Goldstein is the founder of Colorado Ocean Coalition. Vicki has worked in the non-profit and ocean conservation field for over twenty-five years addressing a multitude of issues including vessel traffic, sustainable seafood, oil spill contingency planning, and fisheries interactions. While working for NOAA she co-wrote the Monterey Bay National Marine Sanctuary Designation Documents. During her 10 years as Executive Director of Save Our Shores, she initiated and organized the first Central California Fishermen’s Forum on Marine Protected Areas and developed the Sanctuary Stewards Certification and Dock Walkers Programs. In 2010, she formed the Colorado Ocean Coalition where she is protecting oceans from a mile high. Randy Hayes is founder and Board President of the Rainforest Action Network, consultant to World Future Council and Principle Organizer for Foundation Earth. Randy is a veteran of many high-visibility corporate accountability campaigns and has advocated for the rights of Indigenous peoples. He worked as the President of the City of San Francisco Commission on the Environment and as Director of Sustainability in the Office of the Mayor of Oakland. Randy has a Master’s degree in Environmental Planning. David Helvarg is founder and President of the Blue Frontier Campaign. A long time ocean enthusiast, he is the author of Saved by the Sea, Rescue Warriors, Blue Frontier, 50 Ways to Save the Ocean and The War Against the Greens, and editor of The Ocean and Coastal Conservation Guide. He has worked as a war correspondent and award-winning journalist in Northern Ireland and Central America, and reported from every continent, including Antarctica. 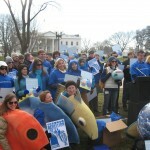 Cindy Zipf is founder and Executive Director of Clean Ocean Action, a broad-based coalition of 180 organizations, and the Mid-Atlantic region’s largest and most effective voice for the sea. In her position as founder and Director of COA she has helped lead efforts that resulted in the passage of landmark federal and state legislation.